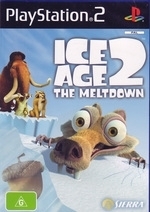 Those whacky and loveable creatures from the hit blockbuster Ice Age return on the PlayStation 2 in the movie of the same name, Ice Age 2 the Meltdown. Unfortunately for our favourite heroes, something is wrong in the ice age and when the glaciers start melting, it's up to Manny the Mammoth, Sid the Sloth, Diego and Sabre-toothed tiger and Scrat the rat to save the world. 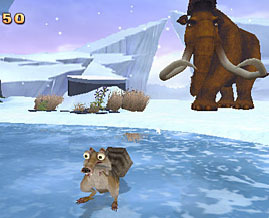 The storyline of Ice Age is nicely progressed through snippets from the movie and some entertaining in-game cutscenes that flawlessly flow with the gameplay but a word of warning, for those gamers that don't want to spoil the movie, you might want to wait until you've seen the motion picture before tackling the game. Although the primary audience for this title is children, the developers have ensured that the gameplay will suite a wide variety of people, young and old alike. And although the gameplay of Ice Age 2 is that of a traditional arcade/platformer game, players can perform a variety of maneuvers and our favourite little rat, Scrat, can not only do the usual moves but he can also swim, dig and even sniff his way to victory. The game revolves around a plethora of different mini-games and sub quests that can all be solved through a variety of pre-determined puzzles that will probably not give any seasoned gamers any hassles but for the newbies, they may need to download the walkthrough. 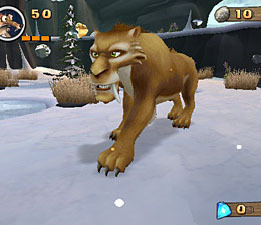 Graphically, Ice Age 2 is a visual treat on the PlayStation 2 that features a plethora of special effects and professionally recreated scenes from the movie to give this game a real "cartoon" feeling. Apart from the colourful background environments, Ice Age 2 also features some great character design and one could almost be forgiven in thinking that they are watching the actual movie. As with the graphics, the sound effects, voice acting and soundtrack have been taken directly from the movie and to make things even more interesting, some of the stars from the movie have been hired to reenact their characters to include greats such as Ray Romano, John Leguizamo and even Denis Leary. In conclusion, Ice Age 2 the Meltdown makes the perfect transition from the big screen to the PlayStation 2 that kids of all ages will simply adore. As they say in the classics, if it ain't broke, don't fix and the traditional arcade formula behind this title makes this game one interesting title, both through gameplay and graphics. Recommended!